PROPAINT Painting & Renovations provides professional roof cleaning services for both residential and commercial properties. Cleaning a roof is the process of removing any dirt, moss or algae or old chipped paint from your roof. By cleaning the roof of your property, it extends the roof life expectancy. You will notice over time, it is usually one side that contains more dirt and fungus than others parts, this part is usually in the shade. This is because the shaded parts or north facing roofs hold more moisture due to the lack of direct sunlight. 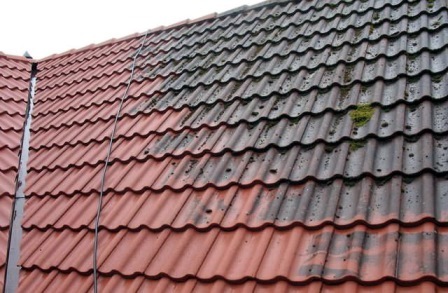 Roof leaks: If you roof is covered in certain areas with thick moss growth, the water can’t move down between the tiles or slates and causes water build-up, which in turn causes roof leaks. Property value: If your property looks old and dirty, it will devalue your property and your house would look worse than it actually is. A roof covered in moss or chipped paint is unsightly. A roof covered with fungus is not a thermal efficient roof. The fungus absorbs the heat from the sun, causing a lack of insulation. When roof slates or tiles are infested with fungus, it becomes porous, which shortens the lifespan of the tiles and slates. Consider your health: If you suffer from asthma or allergies, being close to fungus can be harmful to your health. 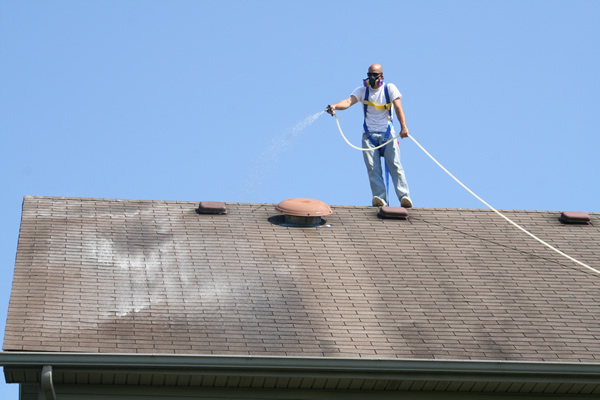 When cleaning a roof we use high-pressure water spray and brushes. The staff at PROPAINT are fully trained and provide a high level of workmanship and adhere to strict safety standards.